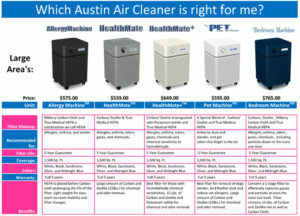 Austin air purifiers are economical, reliable, and simplistic HEPA quality solutions to your air purifying needs without all the complex bells and whistles. If you like a unit that is maintenance free but does the job consistently and successfully, then Austin is the brand for you. Austin air purifiers carry a 5 year warranty coverage on their air filters and perform at above average efficiency. As advocates of chemical and toxin free sleep environments, Natural Sleep Mattress believes and trusts in Austin.